THE HOMERIC HYMNS are a collection of thirty-three Greek poems composed in the old Epic style. They range in length from 3 to 500 lines. The shortest of these are brief invocations which served as preludes to longer festival recitations of epic. The largest four are complete epic narrative poems in themselves. The dating and authorship of the Hymns is complex. Greek writers assigned several authors including Homer, Pamphos (Hymn to Demeter), and Cynaethus of Chios (Hymn to Apollo). However they are now regarded as a largely anonymous collection of works. The majority of the collection, including the longer hymns, dates from the C7th - C6th B.C. A few of the shorter poems are clearly Hellenistic, and the Hymn to Ares was probably composed in Roman times. 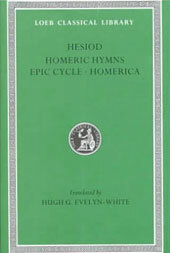 Hesiod, Homeric Hymns, Epic Cycle, Homerica. Translated by Evelyn-White, H G. Loeb Classical Library Volume 57. Cambridge, MA, Harvard University Press; London, William Heinemann Ltd. 1914. The Evelyn-White volume is no longer in print but second-hand copies might be obtained from Amazon.com sellers (click on image right for details). In addition to the Homeric Hymns the volume also contains Hesiod's Theogony, Works and Days, Shield of Heracles, Hesiodic fragments, and fragments of the Epic Cycle poems. Loeb has now replaced this volume with three new translations, one containing the works Hesiod, another fragments of early Greek Epic, and the third the Homeric Hymns and Homerica. These, as well as several other more recent translations and academic commentaries, appear in the booklist (left below). ((lacuna)) . . . For some say, at Dracanum; and some, on windy Icarus; and some, in Naxos, O Heaven-born, Insewn2; and others by the deep-eddying river Alpheus that pregnant Semele bare you to Zeus the thunder-lover. And others yet, lord, say you were born in Thebes; but all these lie. The Father of men and gods gave you birth remote from men and secretly from white-armed Hera. There is a certain Nysa, a mountain most high and richly grown with woods, far off in Phoenice, near the streams of Aegyptus. ((lacuna)) . . .
 [Zeus speaking:] " . . . and men will lay up for her3 many offerings in her shrines. And as these things are three,4 so shall mortals ever sacrifice perfect hecatombs to you at your feasts each three years." I begin to sing of rich-haired Demeter, awful goddess -- of her and her trim-ankled daughter whom Aidoneus rapt away, given to him by all-seeing Zeus the loud-thunderer. He caught her up reluctant on his golden car and bare her away lamenting. Then she cried out shrilly with her voice, calling upon her father, the Son of Cronos, who is most high and excellent. But no one, either of the deathless gods or of mortal men, heard her voice, nor yet the olive-trees bearing rich fruit: only tender-hearted Hecate, bright-coiffed, the daughter of Persaeus, heard the girl from her cave, and the lord Helios, Hyperion's bright son, as she cried to her father, the Son of Cronos. But he was sitting aloof, apart from the gods, in his temple where many pray, and receiving sweet offerings from mortal men. So he, that Son of Cronos, of many names, who is Ruler of Many and Host of Many, was bearing her away by leave of Zeus on his immortal chariot -- his own brother's child and all unwilling. And so long as she, the goddess, yet beheld earth and starry heaven and the strong-flowing sea where fishes shoal, and the rays of the sun, and still hoped to see her dear mother and the tribes of the eternal gods, so long hope calmed her great heart for all her trouble ((lacuna)) . . . and the heights of the mountains and the depths of the sea rang with her immortal voice: and her queenly mother heard her. Bitter pain seized her heart, and she rent the covering upon her divine hair with her dear hands: her dark cloak she cast down from both her shoulders and sped, like a wild-bird, over the firm land and yielding sea, seeking her child. But no one would tell her the truth, neither god nor mortal men; and of the birds of omen none came with true news for her. Then for nine days queenly Deo wandered over the earth with flaming torches in her hands, so grieved that she never tasted ambrosia and the sweet draught of nectar, nor sprinkled her body with water. But when the tenth enlightening dawn had come, Hecate, with a torch in her hands, met her, and spoke to her and told her news: "Queenly Demeter, bringer of seasons and giver of good gifts, what god of heaven or what mortal man has rapt away Persephone and pierced with sorrow your dear heart? For I heard her voice, yet saw not with my eyes who it was. But I tell you truly and shortly all I know." So, then, said Hecate. And the daughter of rich-haired Rhea answered her not, but sped swiftly with her, holding flaming torches in her hands. So they came to Helios, who is watchman of both gods and men, and stood in front of his horses: and the bright goddess enquired of him: "Helios, do you at least regard me, goddess as I am, if ever by word or deed of mine I have cheered your heart and spirit. Through the fruitless air I heard the thrilling cry of my daughter whom I bare, sweet scion of my body and lovely in form, as of one seized violently; though with my eyes I saw nothing. But you -- for with your beams you look down from the bright upper air Over all the earth and sea -- tell me truly of my dear child, if you have seen her anywhere, what god or mortal man has violently seized her against her will and mine, and so made off." So said she. And the Son of Hyperion answered her: "Queen Demeter, daughter of rich-haired Rhea, I will tell you the truth; for I greatly reverence and pity you in your grief for your trim-ankled daughter. None other of the deathless gods is to blame, but only cloud-gathering Zeus who gave her to Hades, her father's brother, to be called his buxom wife. And Hades seized her and took her loudly crying in his chariot down to his realm of mist and gloom. Yet, goddess, cease your loud lament and keep not vain anger unrelentingly: Aidoneus, the Ruler of Many, is no unfitting husband among the deathless gods for your child, being your own brother and born of the same stock: also, for honour, he has that third share which he received when division was made at the first, and is appointed lord of those among whom he dwells." So he spake, and called to his horses: and at his chiding they quickly whirled the swift chariot along, like long-winged birds. Thus they said. And she, that queen among goddesses answered them saying: "Hail, dear children, whosoever you are of woman-kind. I will tell you my story; for it is not unseemly that I should tell you truly what you ask. Doso is my name, for my stately mother gave it me. And now I am come from Crete over the sea's wide back, -- not willingly; but pirates brought be thence by force of strength against my liking. Afterwards they put in with their swift craft to Thoricus, and there the women landed on the shore in full throng and the men likewise, and they began to make ready a meal by the stern-cables of the ship. But my heart craved not pleasant food, and I fled secretly across the dark country and escaped by masters, that they should not take me unpurchased across the sea, there to win a price for me. And so I wandered and am come here: and I know not at all what land this is or what people are in it. But may all those who dwell on Olympus give you husbands and birth of children as parents desire, so you take pity on me, maidens, and show me this clearly that I may learn, dear children, to the house of what man and woman I may go, to work for them cheerfully at such tasks as belong to a woman of my age. Well could I nurse a new born child, holding him in my arms, or keep house, or spread my masters' bed in a recess of the well-built chamber, or teach the women their work." So said the goddess. And straightway the unwed maiden Callidice, goodliest in form of the daughters of Celeus, answered her and said: "Mother, what the gods send us, we mortals bear perforce, although we suffer; for they are much stronger than we. But now I will teach you clearly, telling you the names of men who have great power and honour here and are chief among the people, guarding our city's coif of towers by their wisdom and true judgements: there is wise Triptolemus and Dioclus and Polyxeinus and blameless Eumolpus and Dolichus and our own brave father. All these have wives who manage in the house, and no one of them, so soon as she has seen you, would dishonour you and turn you from the house, but they will welcome you; for indeed you are godlike. But if you will, stay here; and we will go to our father's house and tell Metaneira, our deep-bosomed mother, all this matter fully, that she may bid you rather come to our home than search after the houses of others. She has an only son, late-born, who is being nursed in our well-built house, a child of many prayers and welcome: if you could bring him up until he reached the full measure of youth, any one of womankind who should see you would straightway envy you, such gifts would our mother give for his upbringing." Soon they came to the house of heaven-nurtured Celeus and went through the portico to where their queenly mother sat by a pillar of the close-fitted roof, holding her son, a tender scion, in her bosom. And the girls ran to her. But the goddess walked to the threshold: and her head reached the roof and she filled the doorway with a heavenly radiance. Then awe and reverence and pale fear took hold of Metaneira, and she rose up from her couch before Demeter, and bade her be seated. But Demeter, bringer of seasons and giver of perfect gifts, would not sit upon the bright couch, but stayed silent with lovely eyes cast down until careful Iambe placed a jointed seat for her and threw over it a silvery fleece. Then she sat down and held her veil in her hands before her face. A long time she sat upon the stool6 without speaking because of her sorrow, and greeted no one by word or by sign, but rested, never smiling, and tasting neither food nor drink, because she pined with longing for her deep-bosomed daughter, until careful Iambe -- who pleased her moods in aftertime also -- moved the holy lady with many a quip and jest to smile and laugh and cheer her heart. Then Metaneira filled a cup with sweet wine and offered it to her; but she refused it, for she said it was not lawful for her to drink red wine, but bade them mix meal and water with soft mint and give her to drink. And Metaneira mixed the draught and gave it to the goddess as she bade. So the great queen Deo received it to observe the sacrament7 ((lacuna)) . . .
 Then rich-haired Demeter answered her: "And to you, also, lady, all hail, and may the gods give you good! Gladly will I take the boy to my breast, as you bid me, and will nurse him. Never, I ween, through any heedlessness of his nurse shall witchcraft hurt him nor yet the Undercutter8: for I know a charm far stronger than the Woodcutter, and I know an excellent safeguard against woeful witchcraft." When she had so spoken, she took the child in her fragrant bosom with her divine hands: and his mother was glad in her heart. So the goddess nursed in the palace Demophoon, wise Celeus' goodly son whom well-girded Metaneira bare. And the child grew like some immortal being, not fed with food nor nourished at the breast: for by day rich-crowned Demeter would anoint him with ambrosia as if he were the offspring of a god and breathe sweetly upon him as she held him in her bosom. But at night she would hide him like a brand in the heard of the fire, unknown to his dear parents. And it wrought great wonder in these that he grew beyond his age; for he was like the gods face to face. And she would have made him deathless and unageing, had not well-girded Metaneira in her heedlessness kept watch by night from her sweet-smelling chamber and spied. But she wailed and smote her two hips, because she feared for her son and was greatly distraught in her heart; so she lamented and uttered winged words: "Demophoon, my son, the strange woman buries you deep in fire and works grief and bitter sorrow for me." Thus she spoke, mourning. And the bright goddess, lovely-crowned Demeter, heard her, and was wroth with her. So with her divine hands she snatched from the fire the dear son whom Metaneira had born unhoped-for in the palace, and cast him from her to the ground; for she was terribly angry in her heart. Forthwith she said to well-girded Metaneira: "Witless are you mortals and dull to foresee your lot, whether of good or evil, that comes upon you. For now in your heedlessness you have wrought folly past healing; for -- be witness the oath of the gods, the relentless water of Styx -- I would have made your dear son deathless and unaging all his days and would have bestowed on him everlasting honour, but now he can in no way escape death and the fates. Yet shall unfailing honour always rest upon him, because he lay upon my knees and slept in my arms. But, as the years move round and when he is in his prime, the sons of the Eleusinians shall ever wage war and dread strife with one another continually. Lo! I am that Demeter who has share of honour and is the greatest help and cause of joy to the undying gods and mortal men. But now, let all the people build be a great temple and an altar below it and beneath the city and its sheer wall upon a rising hillock above Callichorus. And I myself will teach my rites, that hereafter you may reverently perform them and so win the favour of my heart." Now when they had finished building and had drawn back from their toil, they went every man to his house. But golden-haired Demeter sat there apart from all the blessed gods and stayed, wasting with yearning for her deep-bosomed daughter. Then she caused a most dreadful and cruel year for mankind over the all-nourishing earth: the ground would not make the seed sprout, for rich-crowned Demeter kept it hid. In the fields the oxen drew many a curved plough in vain, and much white barley was cast upon the land without avail. So she would have destroyed the whole race of man with cruel famine and have robbed them who dwell on Olympus of their glorious right of gifts and sacrifices, had not Zeus perceived and marked this in his heart. First he sent golden-winged Iris to call rich-haired Demeter, lovely in form. So he commanded. And she obeyed the dark-clouded Son of Cronos, and sped with swift feet across the space between. She came to the stronghold of fragrant Eleusis, and there finding dark-cloaked Demeter in her temple, spake to her and uttered winged words: "Demeter, father Zeus, whose wisdom is everlasting, calls you to come join the tribes of the eternal gods: come therefore, and let not the message I bring from Zeus pass unobeyed." Thus said Iris imploring her. But Demeter's heart was not moved. Then again the father sent forth all the blessed and eternal gods besides: and they came, one after the other, and kept calling her and offering many very beautiful gifts and whatever right she might be pleased to choose among the deathless gods. Yet no one was able to persuade her mind and will, so wrath was she in her heart; but she stubbornly rejected all their words: for she vowed that she would never set foot on fragrant Olympus nor let fruit spring out of the ground, until she beheld with her eyes her own fair-faced daughter. So he said. And Aidoneus, ruler over the dead, smiled grimly and obeyed the behest of Zeus the king. For he straightway urged wise Persephone, saying: "Go now, Persephone, to your dark-robed mother, go, and feel kindly in your heart towards me: be not so exceedingly cast down; for I shall be no unfitting husband for you among the deathless gods, that am own brother to father Zeus. And while you are here, you shall rule all that lives and moves and shall have the greatest rights among the deathless gods: those who defraud you and do not appease your power with offerings, reverently performing rites and paying fit gifts, shall be punished for evermore." When he said this, wise Persephone was filled with joy and hastily sprang up for gladness. But he on his part secretly gave her sweet pomegranate seed to eat, taking care for himself that she might not remain continually with grave, dark-robed Demeter. Then Aidoneus the Ruler of Many openly got ready his deathless horses beneath the golden chariot. And she mounted on the chariot, and the strong Slayer of Argos took reins and whip in his dear hands and drove forth from the hall, the horses speeding readily. Swiftly they traversed their long course, and neither the sea nor river-waters nor grassy glens nor mountain-peaks checked the career of the immortal horses, but they clave the deep air above them as they went. And Hermes brought them to the place where rich-crowned Demeter was staying and checked them before her fragrant temple. Then beautiful Persephone answered her thus: "Mother, I will tell you all without error. When luck-bringing Hermes came, swift messenger from my father the Son of Cronos and the other Sons of Heaven, bidding me come back from Erebus that you might see me with your eyes and so cease from your anger and fearful wrath against the gods, I sprang up at once for joy; but he secretly put in my mouth sweet food, a pomegranate seed, and forced me to taste against my will. Also I will tell how he rapt me away by the deep plan of my father the Son of Cronos and carried me off beneath the depths of the earth, and will relate the whole matter as you ask. All we were playing in a lovely meadow, Leucippe9 and Phaeno and Electra and Ianthe, Melita also and Iache with Rhodea and Callirhoe and Melobosis and Tyche and Ocyrhoe, fair as a flower, Chryseis, Ianeira, Acaste and Admete and Rhodope and Pluto and charming Calypso; Styx too was there and Urania and lovely Galaxaura with Pallas who rouses battles and Artemis delighting in arrows: we were playing and gathering sweet flowers in our hands, soft crocuses mingled with irises and hyacinths, and rose-blooms and lilies, marvellous to see, and the narcissus which the wide earth caused to grow yellow as a crocus. That I plucked in my joy; but the earth parted beneath, and there the strong lord, the Host of Many, sprang forth and in his golden chariot he bore me away, all unwilling, beneath the earth: then I cried with a shrill cry. All this is true, sore though it grieves me to tell the tale." So did they turn, with hearts at one, greatly cheer each the other's soul and spirit with many an embrace: their heart had relief from their griefs while each took and gave back joyousness. And all-seeing Zeus sent a messenger to them, rich-haired Rhea, to bring dark-cloaked Demeter to join the families of the gods: and he promised to give her what right she should choose among the deathless gods and agreed that her daughter should go down for the third part of the circling year to darkness and gloom, but for the two parts should live with her mother and the other deathless gods. Thus he commanded. And the goddess did not disobey the message of Zeus; swiftly she rushed down from the peaks of Olympus and came to the plain of Rharus, rich, fertile corn-land once, but then in nowise fruitful, for it lay idle and utterly leafless, because the white grains was hidden by design of trim-ankled Demeter. But afterwards, as springtime waxed, it was soon to be waving with long ears of corn, and its rich furrows to be loaded with grain upon the ground, while others would already be bound in sheaves. There first she landed from the fruitless upper air: and glad were the goddesses to see each other and cheered in heart. Then bright-coiffed Rhea said to Demeter: "Come, my daughter; for far-seeing Zeus the loud-thunderer calls you to join the families of the gods, and has promised to give you what rights you please among the deathless gods, and has agreed that for a third part of the circling year your daughter shall go down to darkness and gloom, but for the two parts shall be with you and the other deathless gods: so has he declared it shall be and has bowed his head in token. But come, my child, obey, and be not too angry unrelentingly with the dark-clouded Son of Cronos; but rather increase forthwith for men the fruit that gives them life." I will remember and not be unmindful of Apollo who shoots afar. As he goes through the house of Zeus, the gods tremble before him and all spring up from their seats when he draws near, as he bends his bright bow. But Leto alone stays by the side of Zeus who delights in thunder; and then she unstrings his bow, and closes his quiver, and takes his archery from his strong shoulders in her hands and hangs them on a golden peg against a pillar of his father's house. Then she leads him to a seat and makes him sit: and the Father gives him nectar in a golden cup welcoming his dear son, while the other gods make him sit down there, and queenly Leto rejoices because she bare a mighty son and an archer. Rejoice, blessed Leto, for you bare glorious children, the lord Apollo and Artemis who delights in arrows; her in Ortygia, and him in rocky Delos, as you rested against the great mass of the Cynthian hill hard by a palm-tree by the streams of Inopus. How, then, shall I sing of you who in all ways are a worthy theme of song? For everywhere, O Phoebus, the whole range of song is fallen to you, both over the mainland that rears heifers and over the isles. All mountain-peaks and high headlands of lofty hills and rivers flowing out to the deep and beaches sloping seawards and havens of the sea are your delight. Shall I sing how at the first Leto bare you to be the joy of men, as she rested against Mount Cynthus in that rocky isle, in sea-girt Delos -- while on either hand a dark wave rolled on landwards driven by shrill winds -- whence arising you rule over all mortal men? "Delos, if you would be willing to be the abode of my son "Phoebus Apollo and make him a rich temple --; for no other will touch you, as you will find: and I think you will never be rich in oxen and sheep, nor bear vintage nor yet produce plants abundantly. But if you have the temple of far-shooting Apollo, all men will bring you hecatombs and gather here, and incessant savour of rich sacrifice will always arise, and you will feed those who dwell in you from the hand of strangers; for truly your own soil is not rich." So spake Leto. And Delos rejoiced and answered and said: "Leto, most glorious daughter of great Coeus, joyfully would I receive your child the far-shooting lord; for it is all too true that I am ill-spoken of among men, whereas thus I should become very greatly honoured. But this saying I fear, and I will not hide it from you, Leto. They say that Apollo will be one that is very haughty and will greatly lord it among gods and men all over the fruitful earth. Therefore, I greatly fear in heart and spirit that as soon as he sets the light of the sun, he will scorn this island -- for truly I have but a hard, rocky soil -- and overturn me and thrust me down with his feet in the depths of the sea; then will the great ocean wash deep above my head for ever, and he will go to another land such as will please him, there to make his temple and wooded groves. So, many-footed creatures of the sea will make their lairs in me and black seals their dwellings undisturbed, because I lack people. Yet if you will but dare to sware a great oath, goddess, that here first he will build a glorious temple to be an oracle for men, then let him afterwards make temples and wooded groves amongst all men; for surely he will be greatly renowned." So said Delos. And Leto sware the great oath of the gods: "Now hear this, Earth and wide Heaven above, and dropping water of Styx (this is the strongest and most awful oath for the blessed gods), surely Phoebus shall have here his fragrant altar and precinct, and you he shall honour above all." Now when Leto had sworn and ended her oath, Delos was very glad at the birth of the far-shooting lord. But Leto was racked nine days and nine nights with pangs beyond wont. And there were with her all the chiefest of the goddesses, Dione and Rhea and Ichnaea and Themis and loud-moaning Amphitrite and the other deathless goddesses save white-armed Hera, who sat in the halls of cloud-gathering Zeus. Only Eilithyia, goddess of sore travail, had not heard of Leto's trouble, for she sat on the top of Olympus beneath golden clouds by white-armed Hera's contriving, who kept her close through envy, because Leto with the lovely tresses was soon to bear a son faultless and strong. Now Leto did not give Apollo, bearer of the golden blade, her breast; but Themis duly poured nectar and ambrosia with her divine hands: and Leto was glad because she had borne a strong son and an archer. But as soon as you had tasted that divine heavenly food, O Phoebus, you could no longer then be held by golden cords nor confined with bands, but all their ends were undone. Forthwith Phoebus Apollo spoke out among the deathless goddesses: "The lyre and the curved bow shall ever be dear to me, and I will declare to men the unfailing will of Zeus." And you, O lord Apollo, god of the silver bow, shooting afar, now walked on craggy Cynthus, and now kept wandering about the island and the people in them. Many are your temples and wooded groves, and all peaks and towering bluffs of lofty mountains and rivers flowing to the sea are dear to you, Phoebus, yet in Delos do you most delight your heart; for there the long robed Ionians gather in your honour with their children and shy wives: mindful, they delight you with boxing and dancing and song, so often as they hold their gathering. A man would say that they were deathless and unageing if he should then come upon the Ionians so met together. For he would see the graces of them all, and would be pleased in heart gazing at the men and well-girded women with their swift ships and great wealth. And there is this great wonder besides -- and its renown shall never perish -- the girls of Delos, hand-maidens of the Far-shooter; for when they have praised Apollo first, and also Leto and Artemis who delights in arrows, they sing a strain-telling of men and women of past days, and charm the tribes of men. Also they can imitate the tongues of all men and their clattering speech: each would say that he himself were singing, so close to truth is their sweet song. And now may Apollo be favourable and Artemis; and farewell all you maidens. Remember me in after time whenever any one of men on earth, a stranger who has seen and suffered much, comes here and asks of you: "Whom think ye, girls, is the sweetest singer that comes here, and in whom do you most delight?" Then answer, each and all, with one voice: "He is a blind man, and dwells in rocky Chios: his lays are evermore supreme." As for me, I will carry your renown as far as I roam over the earth to the well-placed this thing is true. And I will never cease to praise far-shooting Apollo, god of the silver bow, whom rich-haired Leto bare. Leto's all-glorious son goes to rocky Pytho, playing upon his hollow lyre, clad in divine, perfumed garments; and at the touch of the golden key his lyre sings sweet. Thence, swift as thought, he speeds from earth to Olympus, to the house of Zeus, to join the gathering of the other gods: then straightway the undying gods think only of the lyre and song, and all the Muses together, voice sweetly answering voice, hymn the unending gifts the gods enjoy and the sufferings of men, all that they endure at the hands of the deathless gods, and how they live witless and helpless and cannot find healing for death or defence against old age. Meanwhile the rich-tressed Graces and cheerful Seasons dance with Harmonia and Hebe and Aphrodite, daughter of Zeus, holding each other by the wrist. And among them sings one, not mean nor puny, but tall to look upon and enviable in mien, Artemis who delights in arrows, sister of Apollo. Among them sport Ares and the keen-eyed Slayer of Argus, while Apollo plays his lyre stepping high and featly and a radiance shines around him, the gleaming of his feet and close-woven vest. And they, even gold-tressed Leto and wise Zeus, rejoice in their great hearts as they watch their dear son playing among the undying gods. How then shall I sing of you -- though in all ways you are a worthy theme for song? Shall I sing of you as wooer and in the fields of love, how you went wooing the daughter of Azan along with god-like Ischys the son of well-horsed Elatius, or with Phorbas sprung from Triops, or with Ereutheus, or with Leucippus and the wife of Leucippus ((lacuna)) . . . you on foot, he with his chariot, yet he fell not short of Triops. Or shall I sing how at the first you went about the earth seeking a place of oracle for men, O far-shooting Apollo? To Pieria first you went down from Olympus and passed by sandy Lectus and Enienae and through the land of the Perrhaebi. Soon you came to Iolcus and set foot on Cenaeum in Euboea, famed for ships: you stood in the Lelantine plain, but it pleased not your heart to make a temple there and wooded groves. From there you crossed the Euripus, far-shooting Apollo, and went up the green, holy hills, going on to Mycalessus and grassy-bedded Teumessus, and so came to the wood-clad abode of Thebe; for as yet no man lived in holy Thebe, nor were there tracks or ways about Thebe's wheat-bearing plain as yet. And further still you went, O far-shooting Apollo, and came to Onchestus, Poseidon's bright grove: there the new-broken cold distressed with drawing the trim chariot gets spirit again, and the skilled driver springs from his car and goes on his way. Then the horses for a while rattle the empty car, being rid of guidance; and if they break the chariot in the woody grove, men look after the horses, but tilt the chariot and leave it there; for this was the rite from the very first. And the drivers pray to the lord of the shrine; but the chariot falls to the lot of the god. Further yet you went, O far-shooting Apollo, and reached next Cephissus' sweet stream which pours forth its sweet- flowing water from Lilaea, and crossing over it, O worker from afar, you passed many-towered Ocalea and reached grassy Haliartus. Then you went towards Telphusa: and there the pleasant place seemed fit for making a temple and wooded grove. You came very near and spoke to her: "Telphusa, here I am minded to make a glorious temple, an oracle for men, and hither they will always bring perfect hecatombs, both those who live in rich Peloponnesus and those of Europe and all the wave-washed isles, coming to seek oracles. And I will deliver to them all counsel that cannot fail, giving answer in my rich temple." So said Phoebus Apollo, and laid out all the foundations throughout, wide and very long. But when Telphusa saw this, she was angry in heart and spoke, saying: "Lord Phoebus, worker from afar, I will speak a word of counsel to your heart, since you are minded to make here a glorious temple to be an oracle for men who will always bring hither perfect hecatombs for you; yet I will speak out, and do you lay up my words in your heart. The trampling of swift horses and the sound of mules watering at my sacred springs will always irk you, and men will like better to gaze at the well-made chariots and stamping, swift-footed horses than at your great temple and the many treasures that are within. But if you will be moved by me -- for you, lord, are stronger and mightier than I, and your strength is very great -- build at Crisa below the glades of Parnassus: there no bright chariot will clash, and there will be no noise of swift-footed horses near your well-built altar. But so the glorious tribes of men will bring gifts to you as Iepaeon (`Hail-Healer'), and you will receive with delight rich sacrifices from the people dwelling round about." So said Telphusa, that she alone, and not the Far-Shooter, should have renown there; and she persuaded the Far-Shooter. Further yet you went, far-shooting Apollo, until you came to the town of the presumptuous Phlegyae who dwell on this earth in a lovely glade near the Cephisian lake, caring not for Zeus. And thence you went speeding swiftly to the mountain ridge, and came to Crisa beneath snowy Parnassus, a foothill turned towards the west: a cliff hangs over if from above, and a hollow, rugged glade runs under. There the lord Phoebus Apollo resolved to make his lovely temple, and thus he said: "In this place I am minded to build a glorious temple to be an oracle for men, and here they will always bring perfect hecatombs, both they who dwell in rich Peloponnesus and the men of Europe and from all the wave-washed isles, coming to question me. And I will deliver to them all counsel that cannot fail, answering them in my rich temple." "Hear from me, all gods and goddesses, how cloud-gathering Zeus begins to dishonour me wantonly, when he has made me his true-hearted wife. See now, apart from me he has given birth to bright-eyed Athena who is foremost among all the blessed gods. But my son Hephaestus whom I bare was weakly among all the blessed gods and shrivelled of foot, a shame and disgrace to me in heaven, whom I myself took in my hands and cast out so that he fell in the great sea. But silver-shod Thetis the daughter of Nereus took and cared for him with her sisters: would that she had done other service to the blessed gods! O wicked one and crafty! What else will you now devise? How dared you by yourself give birth to bright-eyed Athena? Would not I have borne you a child -- I, who was at least called your wife among the undying gods who hold wide heaven. Beware now lest I devise some evil thing for you hereafter: yes, now I will contrive that a son be born me to be foremost among the undying gods -- and that without casting shame on the holy bond of wedlock between you and me. And I will not come to your bed, but will consort with the blessed gods far off from you." When she had so spoken, she went apart from the gods, being very angry. Then straightway large-eyed queenly Hera prayed, striking the ground flatwise with her hand, and speaking thus: "Hear now, I pray, Earth and wide Heaven above, and you Titan gods who dwell beneath the earth about great Tartarus, and from whom are sprung both gods and men! Harken you now to me, one and all, and grant that I may bear a child apart from Zeus, no wit lesser than him in strength -- nay, let him be as much stronger than Zeus as all-seeing Zeus than Cronos." Thus she cried and lashed the earth with her strong hand. Then the life-giving earth was moved: and when Hera saw it she was glad in heart, for she thought her prayer would be fulfilled. And thereafter she never came to the bed of wise Zeus for a full year, not to sit in her carved chair as aforetime to plan wise counsel for him, but stayed in her temples where many pray, and delighted in her offerings, large-eyed queenly Hera. But when the months and days were fulfilled and the seasons duly came on as the earth moved round, she bare one neither like the gods nor mortal men, fell, cruel Typhaon, to be a plague to men. Straightway large-eyed queenly Hera took him and bringing one evil thing to another such, gave him to the dragoness; and she received him. And this Typhaon used to work great mischief among the famous tribes of men. Whosoever met the dragoness, the day of doom would sweep him away, until the lord Apollo, who deals death from afar, shot a strong arrow at her. Then she, rent with bitter pangs, lay drawing great gasps for breath and rolling about that place. An awful noise swelled up unspeakable as she writhed continually this way and that amid the wood: and so she left her life, breathing it forth in blood. Then Phoebus Apollo boasted over her: "Now rot here upon the soil that feeds man! You at least shall live no more to be a fell bane to men who eat the fruit of the all-nourishing earth, and who will bring hither perfect hecatombs. Against cruel death neither Typhoeus shall avail you nor ill-famed Chimera, but here shall the Earth and shining Hyperion make you rot." Then Phoebus Apollo saw that the sweet-flowing spring had beguiled him, and he started out in anger against Telphusa; and soon coming to her, he stood close by and spoke to her: "Telphusa, you were not, after all, to keep to yourself this lovely place by deceiving my mind, and pour forth your clear flowing water: here my renown shall also be and not yours alone?" Then Phoebus Apollo pondered in his heart what men he should bring in to be his ministers in sacrifice and to serve him in rocky Pytho. And while he considered this, he became aware of a swift ship upon the wine-like sea in which were many men and goodly, Cretans from Cnossos,10 the city of Minos, they who do sacrifice to the prince and announce his decrees, whatsoever Phoebus Apollo, bearer of the golden blade, speaks in answer from his laurel tree below the dells of Parnassus. These men were sailing in their black ship for traffic and for profit to sandy Pylos and to the men of Pylos. But Phoebus Apollo met them: in the open sea he sprang upon their swift ship, like a dolphin in shape, and lay there, a great and awesome monster, and none of them gave heed so as to understand11; but they sought to cast the dolphin overboard. But he kept shaking the black ship every way and make the timbers quiver. So they sat silent in their craft for fear, and did not loose the sheets throughout the black, hollow ship, nor lowered the sail of their dark-prowed vessel, but as they had set it first of all with oxhide ropes, so they kept sailing on; for a rushing south wind hurried on the swift ship from behind. First they passed by Malea, and then along the Laconian coast they came to Taenarum, sea-garlanded town and country of Helios who gladdens men, where the thick- fleeced sheep of the lord Helios feed continually and occupy a glad-some country. There they wished to put their ship to shore, and land and comprehend the great marvel and see with their eyes whether the monster would remain upon the deck of the hollow ship, or spring back into the briny deep where fishes shoal. But the well-built ship would not obey the helm, but went on its way all along Peloponnesus: and the lord, far-working Apollo, guided it easily with the breath of the breeze. So the ship ran on its course and came to Arena and lovely Argyphea and Thryon, the ford of Alpheus, and well-placed Aepy and sandy Pylos and the men of Pylos; past Cruni it went and Chalcis and past Dyme and fair Elis, where the Epei rule. And at the time when she was making for Pherae, exulting in the breeze from Zeus, there appeared to them below the clouds the steep mountain of Ithaca, and Dulichium and Same and wooded Zacynthus. But when they were passed by all the coast of Peloponnesus, then, towards Crisa, that vast gulf began to heave in sight which through all its length cuts off the rich isle of Pelops. There came on them a strong, clear west-wind by ordinance of Zeus and blew from heaven vehemently, that with all speed the ship might finish coursing over the briny water of the sea. So they began again to voyage back towards the dawn and the sun: and the lord Apollo, son of Zeus, led them on until they reached far-seen Crisa, land of vines, and into haven: there the sea-coursing ship grounded on the sands. "Strangers, who are you? Whence come you sailing along the paths of the sea? Are you for traffic, or do you wander at random over the sea as pirates do who put their own lives to hazard and bring mischief to men of foreign parts as they roam? Why rest you so and are afraid, and do not go ashore nor stow the gear of your black ship? For that is the custom of men who live by bread, whenever they come to land in their dark ships from the main, spent with toil; at once desire for sweet food catches them about the heart." So speaking, he put courage in their hearts, and the master of the Cretans answered him and said: "Stranger -- though you are nothing like mortal men in shape or stature, but are as the deathless gods -- hail and all happiness to you, and may the gods give you good. Now tell me truly that I may surely know it: what country is this, and what land, and what men live herein? As for us, with thoughts set otherwards, we were sailing over the great sea to Pylos from Crete (for from there we declare that we are sprung), but now are come on shipboard to this place by no means willingly -- another way and other paths -- and gladly would we return. But one of the deathless gods brought us here against our will." Then far-working Apollo answered then and said: "Strangers who once dwelt about wooded Cnossos but now shall return no more each to his loved city and fair house and dear wife; here shall you keep my rich temple that is honoured by many men. I am the son of Zeus; Apollo is my name: but you I brought here over the wide gulf of the sea, meaning you no hurt; nay, here you shall keep my rich temple that is greatly honoured among men, and you shall know the plans of the deathless gods, and by their will you shall be honoured continually for all time. And now come, make haste and do as I say. First loose the sheets and lower the sail, and then draw the swift ship up upon the land. Take out your goods and the gear of the straight ship, and make an altar upon the beach of the sea: light fire upon it and make an offering of white meal. Next, stand side by side around the altar and pray: and in as much as at the first on the hazy sea I sprang upon the swift ship in the form of a dolphin, pray to me as Apollo Delphinius; also the altar itself shall be called Delphinius and overlooking12 for ever. Afterwards, sup beside your dark ship and pour an offering to the blessed gods who dwell on Olympus. But when you have put away craving for sweet food, come with me singing the hymn Ie Paean (Hail, Healer! ), until you come to the place where you shall keep my rich temple." So said Apollo. And they readily harkened to him and obeyed him. First they unfastened the sheets and let down the sail and lowered the mast by the forestays upon the mast-rest. Then, landing upon the beach of the sea, they hauled up the ship from the water to dry land and fixed long stays under it. Also they made an altar upon the beach of the sea, and when they had lit a fire, made an offering of white meal, and prayed standing around the altar as Apollo had bidden them. Then they took their meal by the swift, black ship, and poured an offering to the blessed gods who dwell on Olympus. And when they had put away craving for drink and food, they started out with the lord Apollo, the son of Zeus, to lead them, holding a lyre in his hands, and playing sweetly as he stepped high and featly. So the Cretans followed him to Pytho, marching in time as they chanted the Ie Paean after the manner of the Cretan paean-singers and of those in whose hearts the heavenly Muse has put sweet-voiced song. With tireless feet they approached the ridge and straightway came to Parnassus and the lovely place where they were to dwell honoured by many men. There Apollo brought them and showed them his most holy sanctuary and rich temple. But their spirit was stirred in their dear breasts, and the master of the Cretans asked him, saying: "Lord, since you have brought us here far from our dear ones and our fatherland, -- for so it seemed good to your heart, -- tell us now how we shall live. That we would know of you. This land is not to be desired either for vineyards or for pastures so that we can live well thereon and also minister to men." Then Apollo, the son of Zeus, smiled upon them and said: "Foolish mortals and poor drudges are you, that you seek cares and hard toils and straits! Easily will I tell you a word and set it in your hearts. Though each one of you with knife in hand should slaughter sheep continually, yet would you always have abundant store, even all that the glorious tribes of men bring here for me. But guard you my temple and receive the tribes of men that gather to this place, and especially show mortal men my will, and do you keep righteousness in your heart. But if any shall be disobedient and pay no heed to my warning, of if there shall be any idle word or deed and outrage as is common among mortal men, then other men shall be your masters and with a strong hand shall make you subject for ever. All has been told you: do you keep it in your heart." 1. ll. 1-9 are preserved by Diodorus Siculus iii. 66. 3; ll. 10-21 are extant only in M.
2. Dionysus, after his untimely birth from Semele, was sewn into the thigh of Zeus. 3. sc. Semele. Zeus is here speaking. 4. The reference is apparently to something in the body of the hymn, now lost. 5. The Greeks feared to name Pluto directly and mentioned him by one of many descriptive titles, such as "Host of Many": compare the Christian use of O Diabolos or our "Evil One." 6. Demeter chooses the lowlier seat, supposedly as being more suitable to her assumed condition, but really because in her sorrow she refuses all comforts. 7. An act of communion -- the drinking of the potion here described -- was one of the most important pieces of ritual in the Eleusinian mysteries, as commemorating the sorrows of the goddess. 8. Undercutter and Woodcutter are probably popular names (after the style of Hesiod's "Boneless One") for the worm thought to be the cause of teething and toothache. 9. The list of names is taken -- with five additions -- from Hesiod, Theogony 349 ff. : for their general significance see note on that passage. 10. Inscriptions show that there was a temple of Apollo Delphinius (cp. ii. 495-6) at Cnossus and a Cretan month bearing the same name. 11. sc. that the dolphin was really Apollo. 12. The epithets are transferred from the god to his altar "Overlooking" is especially an epithet of Zeus, as in Apollonius Rhodius ii. 1124.